The most common animals to spot in the park and the top wildlife viewing locations. 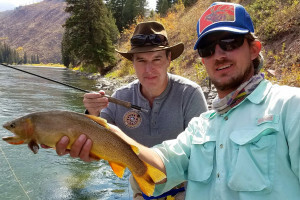 Many of the visitors to the Northwest Corner of Wyoming come initially to visit Yellowstone National Park, but once they get their first glimpse of the Grand Tetons, they feel the undeniable pull of the majestic mountains. Despite its small size, only 26 miles wide and 45 miles long, this remarkable landscape provides habitat for a diversity of wildlife. 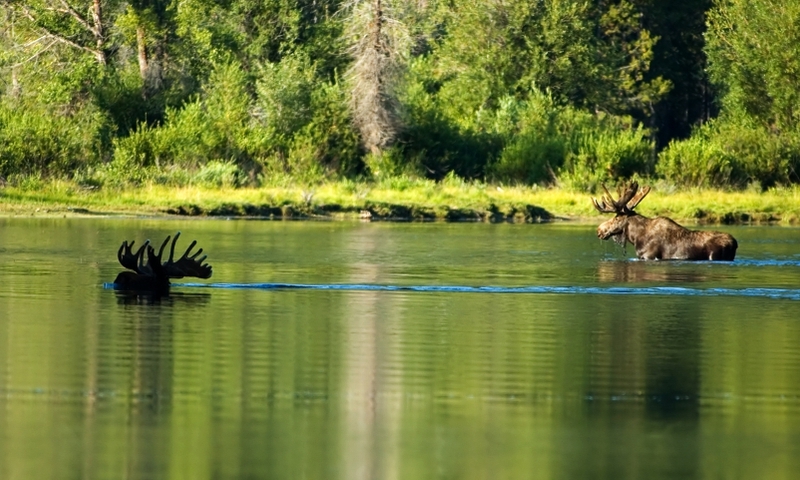 In fact, wildlife viewing is one of the major attractions in Grand Teton National Park. Sixty-one species of mammals live beneath the peaks of the Teton Range. Moose, elk, bison and pronghorns can often be seen from the roadways in the Park, however to see grizzly bears, black bears, wolves and mountain lions; you will need to take one of the many hiking trails. Wildlife can actually been seen just about anywhere in Grand Teton National Park. The Jackson Hole Airport is surrounded by the Park, so if you travel into the area by plane, you can start your wildlife viewing, the minute you get on the ground. There are moose that occasionally stop by the Jackson Hole Aviation Center (the private facility at the airport) just to say “hi”, a family of foxes live between the airport facility and the main highway and occasionally travel alongside the Airport Road. A herd of buffalo can be seen roaming along the sagebrush bench just across Highway 89 from the airport. Plan to start your day early or to travel during dusk. Most animals will “shade-up” during the heat of the day and travel and/or graze during the cooler morning or evening hours. The Park's southern border as you head north from Jackson, Wyoming on Highway 89 is only four miles from town. Although you do not get to an entrance gate until further down the road. As you drive north, you will see a vast valley and wonder why the City of Jackson has not developed that land. If you pass that way in the winter months, you will know the answer – the National Elk Refuge encompasses the complete valley and provides winter grazing space for 5,000-6000 head of elk and 800 head of buffalo. In addition to the view from the main highway, you can also take a leisurely walk or drive along the backside of the Elk Refuge on the Refuge Road. At Miller Butte, you can often see wintering bighorn sheep, as well as the elk and buffalo. And keep your eye open, because the Elk Refuge also provides habitat for several packs of coyotes. Take care if you go all the way out to Miller Butte, because it is the home to a few mountain lions. You have two options for great wildlife viewing as you continue on north on highway 89. You can either continue on north or turn to the west at Moose Junction. There is a slight turn out about ½ mile north of the Junction. Take this and get out of your vehicle to view elk grazing in an area where old beaver ponds have been filled in. Moose can often be seen here as well. As you turn back west at Moose Junction to get to one of the three entrances to the Park, keep a sharp eye out as you drive across the Moose Bridge. This is a favorite hangout for moose. (Do you suppose that is why the early settlers named this area “Moose”?) Look up and down the Snake River here, and you will likely see a moose or two standing in the river, munching on the grass on the bottom of the riverbed and/or eating the bark from the willows that line the river's edge. Check out the sagebrush benches just above the river and you may see bison grazing. Keep an eye out for the little critters, too. Beaver like to eat the willows and play in the water in this area. Once you have passed through the entrance gate at Moose and have received your information package from the nice Park Ranger, you can use your Park Map to locate more great view life viewing spots. Just southeast of Jenny Lake, you will see what resembles an island, which is actually a landmass of tall forest surrounded by sagebrush. Here you can spot small bands of pronghorns as they forage on sagebrush. Elk leave the shade of the forest at dusk to eat. Along this area of the Teton Park Road, you will have additional opportunities to see pronghorn and elk. After you pass the junction for North Jenny Lake, be on the look out for herds of bison. Just a mile before reaching the Jackson Lake Junction, you will come to Oxbow Bend. This is a cut off of the Snake River that provides a slow-moving water habitat for fish that in turn provide food for river otters, beavers and muskrats. As in most all areas of the Park, moose browse on abundant willows at the water's edge and elk occasionally graze in the open aspen groves. Along the eastern shore of Jackson Lake, you will find several turnouts made for picnics, scenic views and wildlife watching. Here you are likely to see mule deer and elk. Remember always view wildlife from a safe distance. Grand Teton National Park is their home and you are just a visitor here.